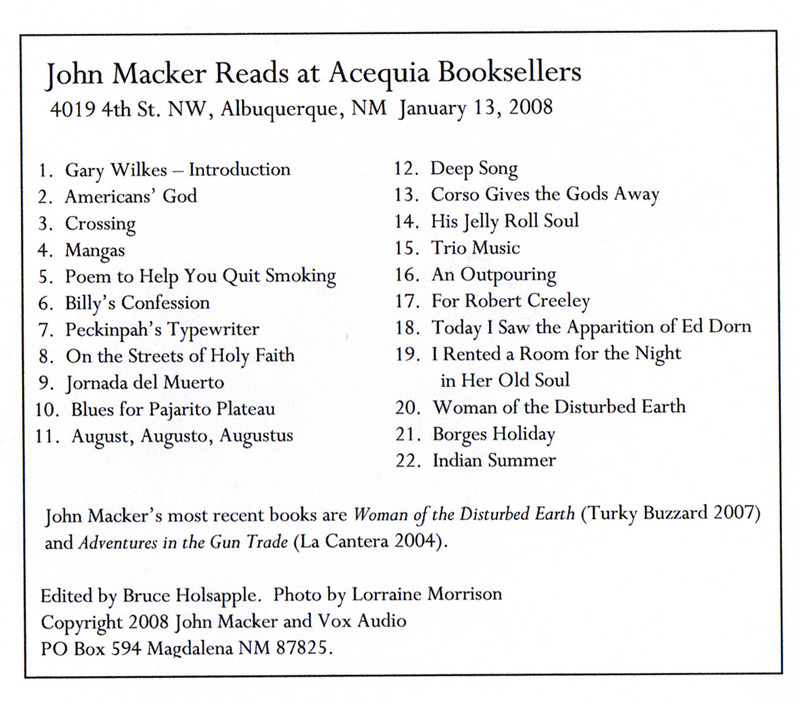 John Macker lives in Northern New Mexico with his wife, Annie, a few miles south of Las Vegas, NM in an old roadhouse on the Santa Fe Trail with some cool views of the llano and he has two dogs and when time permits, listens to the wind… Books and broadsides of poetry include For The Few, The First Gangster, Burroughs At Santo Domingo, 2 +2=1, among others. In 2001, won the James Ryan Morris Memorial “Tombstone” Award for poetry. Has given public readings with writers such as S.A. Griffin, Frank Rios, Tony Scibella, Gregory Corso, Andy Clausen, Ed Dorn, Linda Hogan among others. Has had essays and poems published in journals and magazines throughout the U.S. including, most recently, Manzanita Quarterly, Sin Fronteras (Writers Without Borders), Pitchfork, Black Ace Book 7, Mercury Reader, A People’s Ecology: Explorations In Sustainable Living and a large section from a new manuscript Adventures In The Gun Trade mad blood (considered to be a seminal Outlaw text), was featured in Mad Blood #2, October 2003. In Colorado, in the early-mid 90’s edited the award-winning literary arts journal, Harp, which featured interviews and poetry by Robert Bly, Gregory Corso, Charles Bukowski,Tony Scibella, Diane DiPrima and many others. He has won 2006 the mad blood magazine literary arts award for the poem, “Wyoming Arcane.” Also nominated for 2006 Pushcart Prize. (Oct ’05, October 07).